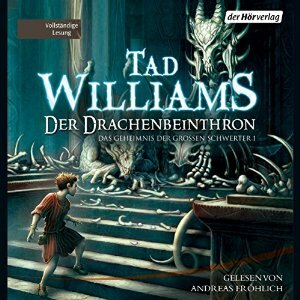 Tad Williams’ novels have long been available as audiobooks in Germany. Now “The Dragonbone Chair”, “Stone of Farewell” and “To Green Angel Tower” will get English-language audiobooks. In Part 4 of our interview with Science Fiction/Fantasy author Tad Williams, Williams revealed plans for audio books for his classic “Memory, Sorrow and Thorn” series. In the US and the UK, the “MS&T” books have never been transferred to audio, other than an edition for sight-impaired readers that was released on audio-cassette in the 1990s. Requests for English-language audiobooks of “Memory, Sorrow and Thorn” have been made for many years, to no avail. German-language audiobooks have been available for a long time. Today, Deborah Beale, wife and business partner of Tad Williams, just tweeted news that casting for the audiobooks for “Memory, Sorrow and Thorn” has commenced. It is presumed that the English-language audiobooks will be released in time for the release of the sequel to “MS&T”, called “The Last King of Osten Ard”. The first volume of the new series, called The Witchwood Crown, is expected in April 2016.